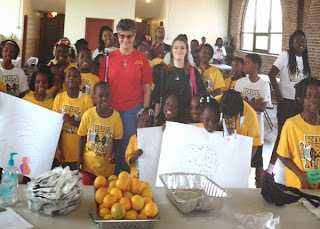 I am picctured below with summer day campers, along with Shelby and Miss Patty Smith (Director of Crane, a nonprofit organization that reaches out to children attending summer camp in the Charleston area). Over the past five years, it has been an honor for me to present for this camp in partnership with Dixie Land Guide Dog Users, Inc. as part of Dixie Land's "Paws 2 Educate" Initiative. Shelby, a fellow Dixie Lander and a high school senior, accompanied me to this camp and for one morning, had her very own class and classroom, reading to different groups of kids and talking with them. She earned the respect of everyone there, including the Director and counselors. Each in our own venue, we gave these summer campers, ranging in age from preschool to middle school, opportunities to talk with us and ask questions about blindness. We also asked them questions about their favorite subjects in school and what they wanted to be when they grew up. At the end of the day, we were all blessed from being able to dialog with one another.